When our client Kulia called to order a cake for her daughter Maya's 3rd birthday, she told us she was having a "messy party" and wanted a cake that would match the theme. 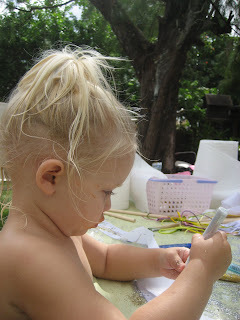 Let the kids do what they do naturally, and what they do best, get MESSY! Kulia wanted to avoid many of the pitfalls that she had witnessed at other parties where children line up and are made to participate in games they don't want to and watch another kid open up gifts when that age group is torn apart by jealousy. 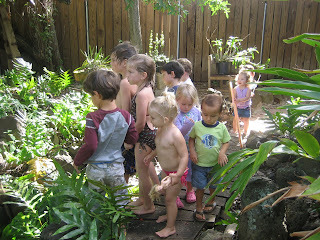 The messy party takes place outside and is made up of "stations" for the children to explore at their own pace. She told me the party was inspired by an article she read online at Mothering Magazine. What a fantastic concept! Where were these messy parties when we were growing up, and is it too late to have one at our age? Intrigued, I asked Kulia to tell me more. 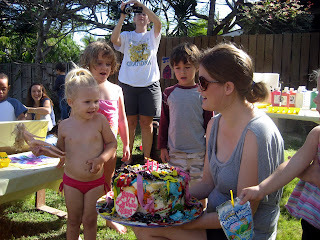 At Maya's messy party, Kulia served sandwiches, fresh fruit and drinks for the kids and Pizza that arrived mid-party. 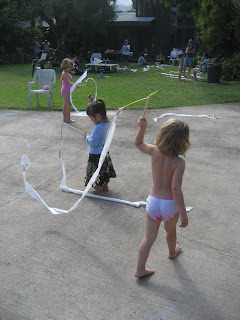 In the yard they had a blow-up pool with water, cups, buckets, a finger painting area, sidewalk chalk, and a glitter/glue/ribbon area where children could decorate their own wands or whatever they wished to make. She told me the most popular "game" was the unplanned Gecko hunting as bands of children attempted to catch them as the geckos ran for the highest tree they could find. They had over 25 children and their parents attend and it was a fun time for all! "When you guys heard about the Messy Party Rick came up with the awesome idea to design a cake that looked like a product of the children at the party. It was the centerpiece of the meal - oohs and ahhs and conversations galore focused on the cake - before people even tasted it! The Guava Lava flavor is always a hit in this house - and we'll be sure to repeat again next year when the party is set to get even messier - cornstarch and water "goo" is on the play menu!" Ooh, Kulia, cornstarch and water "goo" on the play menu? We are SO there! Thank you for sharing your experience and the photos with us. We had a blast making your cake and will look forward to it again next year! 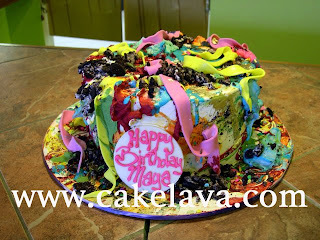 See Maya's Messy Cake and her Ohana photo on cakelava.com. Wow, the cake sure looks messy! Was it harder to build a messy cake than a clean cake? Rick said it was harder to build than other cakes because it can go awry very quickly and you still want it to look good.